James Markey joined the Boston Symphony Orchestra as Bass Trombone in Fall 2012 following a 15-year tenure in the New York Philharmonic as Associate Principal (1997-2007) and Bass Trombone (2007-2012), and a two-year tenure as Principal Trombone of the Pittsburgh Symphony Orchestra. Mr. Markey has had numerous solo appearances, including with the Boston Pops, the Pittsburgh Symphony Orchestra, the Sun Valley Summer Symphony, the United States Army Band, the Hora Decima Brass Ensemble, the New York Staff Band of the Salvation Army, and the Hanover Wind Symphony. A sought-after educator, Mr. Markey has been a featured artist at the International Trombone Festival, the American (formerly Eastern) Trombone Workshop and the conferences of the New Jersey Music Educators Association and the New York State School Music Association. He has also appeared as a guest recitalist and clinician at major educational institutions around the country. He currently serves as bass trombone faculty, as well as Chair of Brass and Percussion, at the New England Conservatory in Boston, and serves as the Trombone Choir Director of the New England Conservatory’s Preparatory School. Additionally, he has served on the faculty of the Juilliard School, Mannes College: the New School for Music, New York University, Purchase College (SUNY), Longy School of Music, Montclair State University, Sarah Lawrence College, and the Juilliard School’s Pre-College Division. Mr. Markey has released four solo recordings: Offroad, on tenor trombone, released in 2003; On Base, a solo bass trombone recording, released in 2009; a two-disc album of orchestral and opera excerpts for bass trombone with Denson Paul Pollard, and a second solo bass trombone recording titled Psychedelia, in 2015. He is also a featured soloist on A Beatiful Noise, a compilation of solos for tenor and bass trombone produced by the Columbus State University Trombone Choir, and on the Hora Decima Brass Ensemble's recording of Janko Nilovic's Concerto for Two Trombones. Mr. Markey studied with Joseph Alessi at the Juilliard School, where he received his Bachelor and Master of Music Degrees in 2005 and 2006. 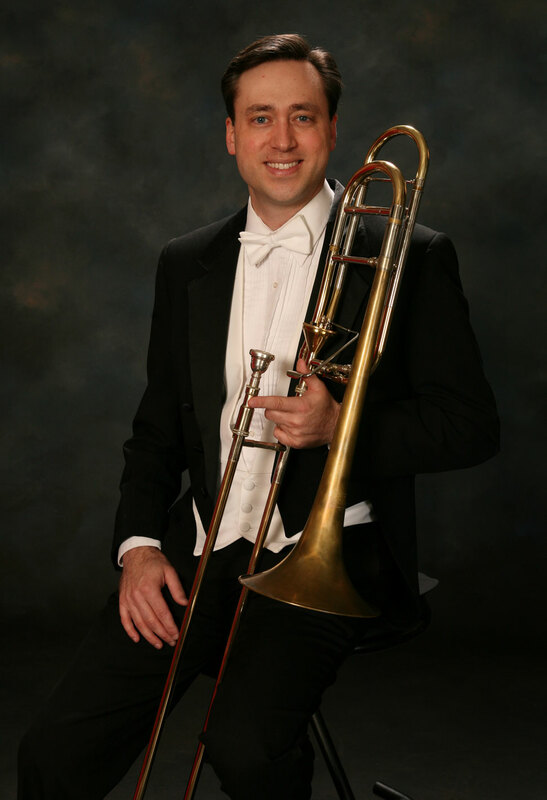 Timothy Higgins joined the San Francisco Symphony as Principal Trombone, occupying the Robert L. Samter Chair, in 2008. He was previously acting second trombone with the National Symphony. A Houston native, Mr. Higgins graduated from Northwestern University and has performed with the Milwaukee, Virginia, and Chicago symphonies, the Civic Orchestra of Chicago, Washington National Opera, and the Baltimore Symphony. In 2005, he won the Robert Marsteller Competition and the ITA Trombone Quartet Competition, both part of the International Trombone Association. Trombonist Brian Santero, hailing from The Hudson Valley region, is thrilled to have joined the New York City Ballet Orchestra in the summer of 2015 as Principal Trombone. Previously, Brian held the same position with the San Antonio Symphony for a subsequent season in 2014 after joining the orchestra as Associate Principal/2nd Trombone in 2013. Frequently exploring the creativity of the trombone outside of the orchestra, Brian has performed solo recitals, given master classes, and collaborated on both contemporary and traditional chamber music performances. As a recent competitor in international solo competitions, Brian has been a grand prize winner of the Steven Zellmer Minnesota Orchestra Competition and the Lewis Van Haney Philharmonic Prize Tenor Trombone Competition in 2013. Earlier In 2011, he was the grand prize winner of the ITA Alto Trombone Competition and the Larry Wiehe Competition where he impressed people of his love of alto trombone and the virtuoso trombone exploits of Arthur Pryor. Brian studied at the Curtis Institute of Music under the mentorship of Nitzan Haroz until 2012. In his spare time, Brian likes to learn about electronics and gadgetry, audiophilia, and disconnecting from the internet in his compact woodshop. John Sebastian Vera, a native of Texas, became the Principal trombonist of the Pittsburgh Opera in 2010 and also joined the River City Brass as Principal Trombone in 2015. A dedicated chamber musician, he also was a founding member of the critically acclaimed Guidonian Hand Trombone Quartet in which he played from 2008-2014. In addition to the Pittsburgh Opera, Mr. Vera has played with the symphonies of Dallas, Detroit, Pittsburgh, the St. Paul Chamber Orchestra, Buffalo, Kennedy Center Opera House, Malaysian Philharmonic, New York City Opera, Vermont, Charleston, Albany, Akron, Harrisburg, American Ballet Theatre, and Orquesta Sinaloa de las Artes in Mexico amongst others. He began his studies with Jon Bohls in Texas and continued his education at Southern Methodist University where he studied with John Kitzman of the Dallas Symphony. He then spent a year studying with Ed Zadrozny as a graduate assistant at the University of Akron, and finished his graduate work in New York City at the Mannes College of Music studying with David Finlayson and James Markey of the New York Philharmonic. In 2009, John was honored to be asked to play alongside the New York Philharmonic trombone section as well as members of the Metropolitan Opera to record two pieces for James Markey’s solo release, “On Base”. In 2011, he spent the summer in Haiti volunteer teaching and performing in the Orchestre Philharmonique Sainte Trinite as well as the Ecole de Musique Dessaix Baptiste which became one of the more profound experiences of his life. With the quartet, John performed over 100 concerts and gave master classes all over the country. Heralded by the New York Times for their "expertly played performances" they have been recipients of numerous national grants which have enabled them to commission countless composers to create new and innovative works for four trombones. In 2014 was the premiere of River of Fundament, a movie by film artist Matthew Barney, in which John recorded for and acted in along with the quartet. Mr. Vera can also be heard on the HBO documentary The Words that Built America as well as on euphonium in the PBS documentary Abraham and Mary Lincoln, A House Divided. John is an Artist for Edwards Instruments and resides in Pittsburgh. He is on the faculty at Slippery Rock University. His favorite musicians include Sigur Ros, Radiohead, the Books, and Efterklang. When he can get away from the trombone he most enjoys basketball, traveling and psychology. Listen to a Divergent Paths with Dan Dunford podcast interview with John here. Follow him on twitter @SebastianVera and on Instagram @js.vera. Nick Schwartz has a diverse career performing across North America, Europe, and Asia. Beginning his trombone studies at the Interlochen Arts Academy, he went on to study at The Juilliard School with then New York Philharmonic bass trombonist Don Harwood. From there, he moved to San Francisco where he began freelancing throughout the Bay Area. In addition to playing in his regular job with the New York City Ballet, he has performed with The Metropolitan Opera, The Pittsburgh Symphony, the New York City Opera, the New York Philharmonic, the Philadelphia Orchestra, The Atlanta Symphony, San Francisco Symphony, San Francisco Ballet, The Minnesota Orchestra, Orchestra of St. Lukes, Orpheus Chamber Orchestra, The Jacksonville Symphony, The Malaysia Philharmonic, Arizona MusicFest, Festival Maribor (Slovenia), and the Festival Lyrique-en-Mer in France. He has recorded with Joe Alessi, principal trombone of the New York Philharmonic, the American Brass Quintet, Orchestra of St. Lukes, has recorded multiple video game soundtracks at Skywalker Ranch in Northern California, and has been a part of multiple movie soundtrack recordings in New York. He has been a member of the New York City Ballet Orchestra since January 2010. Overneath Studios of Kalamazoo recently described Helen Lukan's piano artistry in these words: "From playing with symphonies across the region, to solo recitals and collaborations with Western Michigan University (WMU), Helen's name is synonymous with exquisite piano-craft." A Chicago native, Helen has long been highly regarded as a versatile collaborative pianist in West Michigan and is gaining national notice as a respected collaborator with such groups as the Boston Brass. While she has vast experience accompanying a diverse range of soloists, performing music in every genre, she has an affinity for the trumpet repertoire having worked with trumpeters, Mary Bowden, Dr. Stephen Jones, Rex Richardson, Michael Sachs, and WMU Professors Scott Thornburg and Dr. Robert White. In addition to an ongoing association with the Boston Brass, Helen has performed Gershwin's Three Preludes as a featured artist for the KBR Steinway Sessions Live at Overneath Studios. She has been a featured soloist with the Western Winds, performing another Gershwin favorite, Rhapsody in Blue, and has performed with TubaCOR at Eastman Conservatory for the Women in Music Series. Helen has charmed audiences with her collaborative programs, America: A Musical Tribute! with soprano, Katelin Spencer, and Four-Hand-Frenzy with sister, Clare Chenoweth. Helen is the featured artist, and co-creator with husband Cameron S. Brown of the multi-media presentation, A Kaleidoscope of Sound. While serving as the principal pianist for the Southwest Michigan Symphony Orchestra, Helen also performs regularly with the Grand Rapids Symphony, and frequently substitutes with the Kalamazoo Symphony Orchestra, the South Bend Symphony Orchestra, and the Battle Creek Symphony. She has also performed with the Florida Symphony. Besides her collaborative work with regional orchestras and other ensembles, Helen accompanies a host of students and faculty for recital performances at WMU's School of Music where she earned a Master of Music degree in Piano Performance under the instruction of Phyllis Rappeport and Dr. Robert Ricci. She received her undergraduate degree at Bradley University where she studied with Dr. Edward Kaizer. Her early piano instruction was under the guidance of Bill Stapleton of Chicago. Along with the online KBR Steinway Sessions Live performance, Helen's musical mastery can be heard on the compact disc recordings, Music to Dream By, Nancy Steltmann, cellist, From the Start, Elizabeth Start, composer and cellist, and Shamanic Journey, Deanna Swoboda, tubist. Helen can be contacted through her website at www.HelenLukan.com. Rhonda Sider Edgington is often lauded for her innovative programming, colorful registrations, and exciting playing. Seven years working and studying in Bremen, Germany, originally with Prof. Harld Vogel under a Fulbrigh scholarship, led to her specialization in the repertoire and organs of 17th century Germany. Rhonda has performed at venues such as St. Thomas Fifth Avenue in New York City, and St. Paul Cathedral in Pittsburgh, as well as on important historic instruments in Germany. She has been heard at seven OHS national conventions. Rhonda is Organist/ Assistant Music Director at Hope Church, Accompanist at Hope College, Dean of the Holland, Michigan AGO chapter, and maintains an active performing career. William Mann joined the Georgia State School of Music as the Assistant Professor of Trombone and the Brass Area Coordinator in August 2013. He teaches the trombone studio, brass chamber music, brass techniques, and oversees the brass area. Prior to his appointment at GSU, Dr. Mann served on the faculties at Morehead State University, the University of Missouri, Prairie View A&M University, and the University of Mary-Hardin Baylor. Dr. Mann is regularly sought after as a lecturer, clinician, and performer throughout the United States and Brazil, including the Midwest Trombone Euphonium Conference, the Big 12 Trombone Conference, the Bay View Music Festival, and the Festival Nacional de Musica in Goiania, Brazil. In the summer of 2012, he placed second overall in the solo competition at the International Women’s Brass Conference in Kalamazoo, Michigan, competing against other brass musicians from around the world. Dr. Mann’s orchestral experiences, includes performing with groups including the Atlanta, Chattanooga, Lexington Philharmonic, Ohio Valley, West Virginia, Quad-City, Missouri, Tuscaloosa, Meridian, Victoria, and Waco Symphonies. He has also performed with the Austin Lyric Opera, as well as the Bay View, Victoria Bach, Texas Music, and Hot Springs Music Festivals. He also performs regularly with the Atlanta based Bent Frequency New Music Ensemble. Dr. Mann received his Masters of Music and Doctor of Musical Arts degrees in Trombone Performance from the University of Texas at Austin in addition to a Bachelor of Music Education from Baylor University. His primary teachers include David Gier, David Jackson, Donald Knaub, Allen Barnhill, John Marcellus, and Nathaniel Brickens. Founder of Finance for Musicians and Good Life Wealth Management as well as being a professional trombonist, Scott has been a Financial Advisor since 2004 and a musician for much longer! Before starting his company in 2014, he was Director of Financial Planning for another firm, where he developed financial strategies and provided research and portfolio management on $375 million in client assets. Scott holds the Certified Financial Planner (CFP(R)) and Chartered Financial Analyst (CFA) designations, as well as a Certificate in Financial Planning from Boston University. He is a Fiduciary, which means that he is required to place client interests ahead of his own, a responsibility he takes very seriously. That’s his day gig, but on many nights and weekends, he's a free-lance trombonist in Dallas. Mr. Stratton has been principal trombone of the Garland, Las Colinas, and Arlington Symphonies since 2001, and also performs frequently with his quintet, The Perennial Brass. Scott attended the Oberlin Conservatory, and received a MM, DMA, and Performer’s Certificate from the Eastman School of Music. Scott lives in Dallas, where his talented wife, Erin, is principal oboe of Dallas Symphony Orchestra. When they're not busy with work, they spend time with their three rescue dogs, plus puppies they foster for Operation Kindness . Mr. Stratton serves as a board member and treasurer for Artists For Animals , a non-profit organization which brings artists together to collaborate and raise money in support of animal rescue. Gabriel Colby feels very fortunate to be performing, teaching, and coaching around the world. Currently, Gabriel Colby resides in Pittsburgh where he plays associate principal trombone for the River City Brass Band. Gabriel also plays lead trombone for Beauty Slap (a genre bending electronic funk), C Street Brass, and Nu Deco Ensemble a contemporary chamber orchestra located in Miami, Florida. As a lead trombonist he has played for the ESPY Awards Orchestra in LA, The Nascar Awards Show in Las Vegas, and can he can be heard on the ESPN College Football theme. Gabriel has a B.M. from Peabody Conservatory and a M.M. from Carnegie Mellon. He initially found his love for trombone through classical music, but now enjoys playing and performing music of all genres. In addition to his music and performance career, Gabriel has studied a variety of different movement disciplines. Gabriel is proud to have earned a fitness certification through GMB which encourages fun, smart exercise for physical autonomy. Gabriel most enjoys using his knowledge of movement to help musicians enjoy a pain free playing experience! As well as working one-on-one with clients in person and remotely, Gabriel teaches workshops on flexibility, locomotion, strength, and handstands. Gabriel grew up in Avon, Connecticut surrounded by music. His parents John Colby and Beverly Rohlehr, and his sister Liza Colby are all accomplished musicians in their own right. Little known fact- Gabriel started his performance career in high school as a professional juggler in the duo ‘The Big Hair Jugglers’. Contrary to popular belief, Gabriel does not play trombone and do handstands twenty-four hours a day. He also loves: pull ups, cooking, tequila, and exploring Pittsburgh, the city he calls home. A native Texan, Steve Gellersen is currently living in Seattle, WA as a free-lance bass trombonist. He has performed throughout the country with ensembles such as the Vienna Chamber Orchestra, Cleveland Pops Orchestra, Blossom Festival Orchestra, Palm Beach Opera, and Steel City 5. Mr. Gellersen’s primary teachers include Massimo La Rosa, Rick Stout, Dan Satterwhite, Murray Crewe, Ron Wilkins, and Tom Riccobono. Steve began studying trombone in San Antonio with Ron Wilkins, focusing on jazz. He then finished high school at the Interlochen Arts Academy before beginning college in Pittsburgh, PA at Duqesne University and continued on to complete his BM at the Cleveland Institute of Music. Steve then received a MM from the Lynn Conservatory of Music in Boca Raton, FL where he was a founding member of the $5 Pitcher Low Brass and Drums quintet, merging the low brass sound with popular music. He can be heard performing with them on YouTube. Steve continued his graduate studies back at the Cleveland Institute, and most recently at Carnegie Mellon University. When away from the trombone Steve enjoys basketball and fantasy football, and considers himself an accomplished home-brewer. 2015-2016, Taylor was the bass trombonist with the North State Symphony in Chico, California. Pittsburgh, Taylor has performed with the Pittsburgh Symphony Brass and the River City Brass Band. nine, which he continued to play throughout high school. At age twelve, Taylor found his love for the brass family when he taught himself the euphonium, which he played into college. Learning the trombone at his teacher's suggestion, Taylor received a Bachelor’s of Music Degree from Sacramento State University under the guidance of Joel Elias of the Sacramento Philharmonic. Philharmonic, Abbie Conant. He has also attended the Aspen Music Festival, Music at Menlo, and the Third Coast Trombone Retreat.